Every kitchen needs a coleslaw recipe. 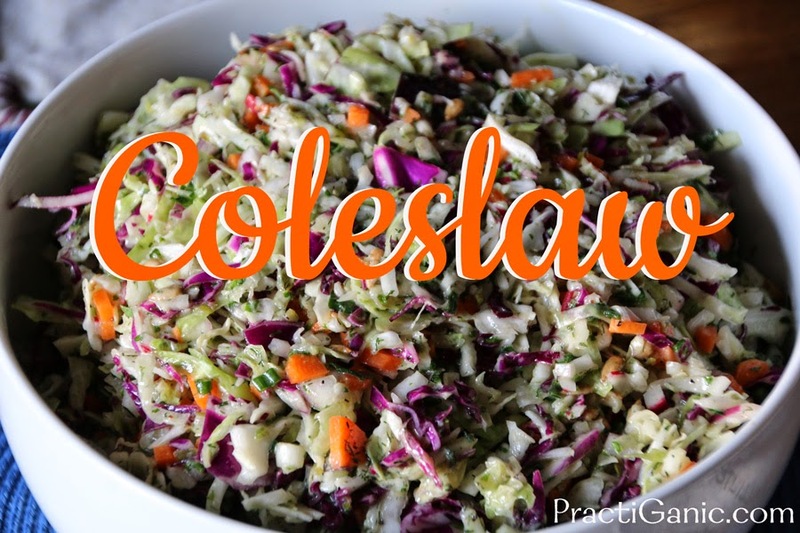 If you aren't a coleslaw fan, I'm convinced you just haven't found your recipe yet. Coleslaw can go on or next to a sandwich, it makes the perfect side for any cookout or is a great snack when you need an on-the-go salad. The greatest thing is, it's cheap, easy to make and stores really well! In summer, we are on the go a lot, as you probably are too. I love making a big bowl of coleslaw in the beginning of the week to quickly grab when I need a bite to fill up in between errands or playing outside. It's light and refreshing and I'm always glad it's there. I probably have a dozen coleslaw recipes that I make but they all come from the following recipe. I may add a veggie that's been in the fridge that I want to use up or add a little tamari, sesame oil and almonds to give it an asian flare. Make it a coleslaw you will love! This isn't an overly creamy coleslaw and the peppers give it just a little kick! Mix all of your vegetables and seeds in a bowl. In a separate bowl, mix your dressing ingredients. Then combine, coating all of your coleslaw with the dressing. I like it best the next day when the dressing has a chance to really come together.